The LED encapsulation market has seen steady growth over the past year. According to a latest industry report, the annual revenue of global LED package market was up to US$15.975 billion in the year 2016, and reached US$18.035 billion in the year 2017. Based on the revenue of 2017, the top three LED package suppliers worldwide were Nichia, OSRAM Opto Semiconductors, and Lumileds, while MLS from China mainland climbed to fourth place owing to its significant capacity expansion efforts. Revenue statistics are based on the sales of LED packages. LED chips,LED lights,sensor modules,laser LEDs and other products are excluded from the calculations. MLS has made continuous capacity expansion due to the increasing demand in the market of LED lighting and display. In the revenue ranking of global LED package market, MLS was the seventh in 2016 and climbed to the fourth in 2017. Seoul Semiconductor has benefited from significant growth in sales of backlight CSP, flash LEDs, lighting, automotive LED lights and UV products, and ranked fifth. 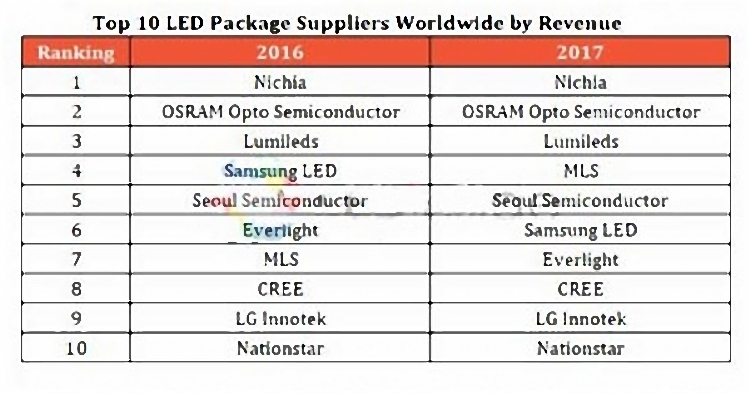 Nichia kept the revenue leader in global LED package market for the year 2017, but has been challenged by its competitors in the line of blue LED. Therefore, Nichia has active in fields like WCG (Wide Color Gamut) backlight LED, UV LED, blue and green laser, and auto led light, while retaining its market share by holding patent. Among manufacturers based in Europe and the U.S, OSRAM acheives the best revenue performance because of its long-term and solid foundation in automotive LED lights and recent remarkable achievements in infrared sensing. In the general lighting sector, OSRAM now actively launches new products, and outsources the manufacturing of small and medium-power products to OEMs in Taiwan and mainland China, hoping to increase the share in LED lights market. Lumileds and CREE begin to focus on niche applications such as automotive led lighting, niche lighting, and architectural lighting to ensure profitability. Influenced by Chinese LED factories who offer better prices, most Taiwanese LED manufacturers have reduced the proportion of low-profit lighting products in their product coverage, and shifted to applications with high gross profit. For example, Everlight has been actively developing auto led lights, UV/IR lighting, and Mini LED backlight applications, in order to get rid of the Red Ocean. On the other hand, Chinese LED manufacturers have developed rapidly thanks to the rise of domestic market and the increasing demand for general lighting products and displays. Therefore, companies such as MLS and Nationstar continue to expand their production capacity, resulting in their higher revenue ranking. Besides, in recent years, the financial subsidies offered by local governments in China have encouraged a large number of Chinese LED manufacturers to increase production capacity. With the cost advantages, these manufacturers have also received many orders from overseas companies. As the result, Chinese LED manufacturers keep proceeding in the entire ranking of revenue. In the year 2017, the market share of Chinese manufacturers in the global LED packaging market also hit 35%, a five percent increase from the year 2016.